Hello everyone for the very last time in 2014! The year is nearing the end, so I wanted to take a moment to reflect on last year. Alright, I admit it, I totally saw this theme popping up in blogland and thought I'd do the same. I'm not sure how everyone else made their top 10 list, but somehow blogger doesn't have an app for that so I actually took all the posts that I've written and sorted them based on the amount of views they've received. Some surprises there! For example, my office chair was not even in the list! I really wanted to give it an honourable mention though :) The side view picture was actually much better in hindsight but this one will just have to do. And now, without further ado, let's have a look at the 10 most popular posts in 2014. Ready? 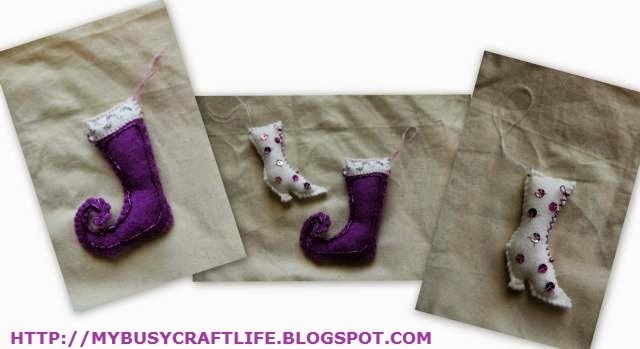 I'll definitely be making this again this year, it's really easy to make and so good. As you know, I made a new advent calendar this year and the pouches were big enough to add a decent gift rather than one tiny (and tbh quite crappy) chocolate. As promised, I made a list of what kind of presents you can add to your advent calendar without having to spend too much money but still have some good quality chocolates and present come Advent time. So in line with the shopping craze of Boxing Day which I carefully avoid, here is my list. Christmassing - Merry Christmas Everyone! Our lovely Christmas tree, I even got some new ornaments this year! Time to enjoy a wonderful Christmas with food, presents, and games. I have to admit, I am backdating this post... I had it all prepared and I was way too busy to actually post this... sorry! The bf had a whistling key finder (yes this was the same one as in week 2, but this was in case he lost the other one, get it? hihi), a Ferrero Rocher chocolate (clearly not pictured as already eaten) and a sweatband where he can stash his tube card when he goes running. My loot for the last few entries was: mini bar of Green & Blacks organic white chocolate, mini bag of Haribo sours (also already fnished), and a mini jar of blue edible glitter. It's been a while since I had a Tourist Tuesday, but the past few weeks have been busy. And what better post to write at the moment than a Christmas Tourist Tuesday? :) Over the past few weeks I've been dragging the bf along to many Christmas events and markets, not all of which he appreciated. Woops... but most were fun for him too so I'm sure it was fine. I took a ton of pictures and because I do want to show you the best ones but I only have time for one post (Christmas Eve is tomorrow after all! ), I made some collages. Just click on the picture if you want to see it bigger. Are you ready? Let's go on a Christmas tour of London! This week, the bf got: Green & Black mini chocolate bar (sea salt), I couldn't find the wrapper so it's not in the piccie but instead I photographer the highlighter tabs from last week. He also got a wooden puzzle, a garlic peeler (that's the blue thing), a pair of Superman socks (much more appreciated than Homer ones), some Haribo sweets (obviously not pictures), and some hand sanitizer. Hey it's hard to buy presents for guys that fit into an advent calendar! There is one more but he hasn't opened today's one yet so it will be on the next list. In true style, they were purple of course. They were lovely and sparkly. The only thing I regret is not adding a proper ribbon to them. I never add ribbon to my ornaments in my trees, I used invisible string instead, so it didn't even occur to me to use ribbon. Doh! I really hope that the people who received them liked them! Christmassing - It's Cookie Day! I declared last Sunday Christmas cookie day. It's been ages since I made proper cookies and what better season for it? I couldn't do it next weekend as I've got a 10K scheduled so I'm going to be like way tired probably (or in pain but I sure hope not!). So right after our yoga session I got started and spent the next 6 hours making cookies. One of the girls at work is allergic to gluten and every time I bake something she can't have any so this time I was going to make something for her too :) And I did it in style! ...and this is the end result! The round ones on the top are gluten-free chocolate sugar cookies, the others are normal sugar cookies. I love the tree especially, and the stocking. I'm quite pleased with the results, and I hope work will be too! The bf got some more Green & Blacks chocolate, some Kinder chocolate, a mini bag of Haribo Christmas sweets, a balloon propeller, a pair the Homer Simpson socks, some highlighter tabs, and a tiny tool to fix glasses which I'm sure will come in super handy. I didnt write down when he got what but this will give you some idea. My look this week was strangely no chocolate at all, three mini cookie cutters (the last one wasnt in the picture), mini jar of green edible glitter, a hair clip, sewing machine needles, and some arrow tabs. 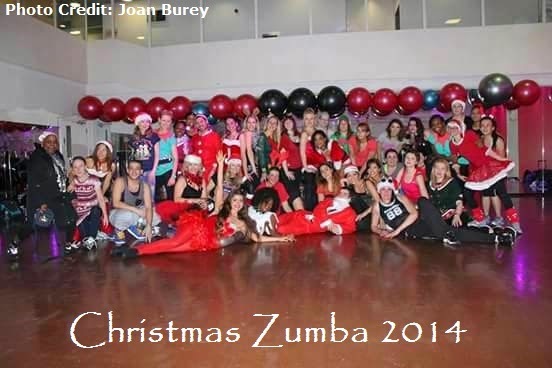 Here is our group picture of the Christmas Zumba session. It was great fun, although my knee hasn't quite recovered from last week's run so at the end I was in pain and a little grumpy.